Why has he been all but erased from history? 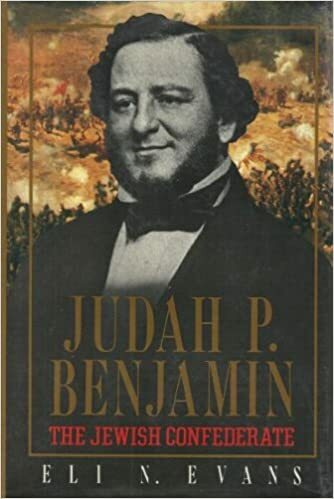 "Judah P. Benjamin was known as "the brains of the Confederacy," its "court Jew," "the statesman of the Lost Cause," and even "the Confederate Kissinger. As, successively, Attorney General, Secretary of War and Secretary of State in the Confederate Cabinet, he was President Jefferson Davis' closest and most trusted adviser." 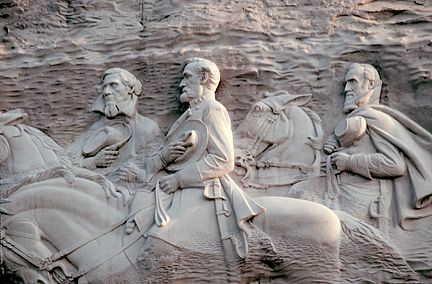 When we think of the Confederacy, the big names that automatically come to mind are the three legends carved into the side of Georgia's Stone Mountain: President Jefferson Davis, General Robert E. Lee and General Stonewall Jackson. Significant figures for sure, but in the grander power-scheme of things, these men, including President Davis himself, were outranked by Judah P. Benjamin. The fact that Benjamin's name is so relatively unknown is, ironically, testament to the awesome "behind-the-scenes" power that he wielded. Unfortunately for the South (and the North), Benjamin's influence served neither of the Americas. His loyalties were elsewhere - in Rothschild's London! Benjamin's image never made it to Stone Mountain, but his 'mug-shot' did appear on Confederate currency and bonds! Erlanger's financing of the South, as confirmed even by contemporray New York Times articles, is directly linked to the House of Rothschild. 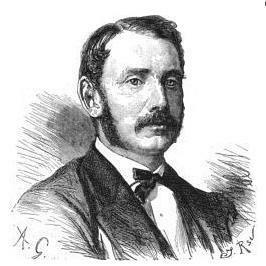 (here) Pappa-in-Law Slidell would later serve the Confederate States government as foreign diplomat to Great Britain and French Emperor Napoleon III. Now the niece of the influential Senator is married to northern financier August Belmont (Schönberg)- Rothschild’s Jewish boy and Democrat boss supporting the Northern cause, at least at first. After the war, “Confederate” Slidell will make his “Unionist” nephew-in-law Belmont his political protégé. Also hooked up with Senator Slidell in this tangled North-South-Rothschild knot of financial-political intrigue is fellow Louisiana Senator Judah Benjamin, the Jewish big-shot who goes on to become the Confederacy’s Attorney General, then Secretary of War, and then Secretary of State. Through the shadowy fog of 150 years of elapsed history, we can now discern a pattern of divide & conquer, balance of power conspiratorial actions being played upon both sides - and with tragic consequences. Senator Slidell – His Jewish Son-in-Law Erlanger – His Jewish Northern Nephew-in-Law Belmont, and Jewish fellow Senator Benjamin form an incestuous North-South connection with direct links to the House of Rothschild. If the South is to have any chance of gaining independence, it will have to win early, before the more industrialized and populated North can outlast them. The first battle of the war at Bull Run (Manassas, Virginia) is therefore critical. To make a long story short, the rebels force a Union retreat that soon turns into a full rout. 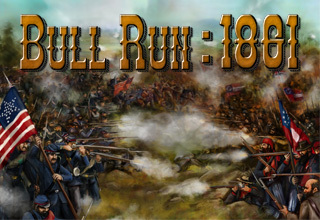 The Battle of Bull Run will soon be referred to by some as “The Battle of Yankee Run". The Union Capital, Washington DC, is just miles away and now essentially undefended. It is the South’s for the taking. The capture of DC and other parts north would have delivered a huge psychological blow to the North. Because many northerners aren’t in favor of the war anyway; the capture of DC might very well have ended the war that same year. But instead of finishing the job, someone has decided to spare the Capital - a decision that inflames the Southern press and leads to bitter finger-pointing. Was it Judah Benjamin, the man so admired by Solomon de Rothschild, (here) who may have whispered poison in Davis’s ear, telling him not to take DC and thus blowing the chance to win the game early for the South? And after Walker has been made the scapegoat and fired; who replaces him as War Secretary? None other than Judah Benjamin! 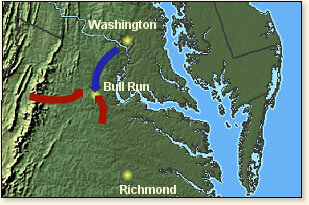 1 & 2 - After Bull Run turned into a rout, Washington DC – just 30 miles away – could have been captured. Whose idea was it to halt? That of Davis -- or his trusted "adviser" Benjamin? 3 - Engraved portraits (from 1861) of the South's chieftains depict Judah Benjamin at the very top (!) with Jefferson Davis in a bigger circle but down lower. Sleazy Slidell with the Rothschild agents for in-laws is to the left of Davis. Could the new War Secretary Benjamin's subsequent 1861 interference with the Generals, - acts so controversial that they would force a Congressional investigation - and his bizarre refusal to supply them as requested have been a ploy designed to prolong the war until Rothschild could bury both sides in debt, before sending the Family's British and French hit-men to divvy up' America into two spheres? Establishment historians will later claim that Benjamin's stubborn defiance of the Generals was due to a lack of supplies in the South. But given how early it was in the war, the claim that supplies were low seems like a cover story. If "lack of supplies" had been the cause of Benjamin's decisions, Generals Stonewall Jackson and P. G. T. Beauregard would not have had reason to dislike Benjamin as they did. Such a delaying scenario would fit perfectly with a Rothschild plan to have a long war, one in which both sides could be indebted and weakened before the British & French can arrive. Generals Jackson, Beauregard and Wise all hated Judah Benjamin. That in mind, let’s take a closer look at the shady Mr. Benjamin. Outwardly, the esteemed Jefferson Davis is the ‘top dog’ of the South – the President of the Confederate States of America. But behind the scenes, Judah Benjamin, with his European connections, 'gift of gab' and impressive intellect is, in the grand scheme of things, more powerful than Davis. What the banking agent Alexander Hamilton had been to George Washington, the trusted Benjamin is to Davis, and then some. Like Hamilton, Benjamin was also born a British subject (West Indies). There is simply no exaggerating the influence of Judah Benjamin. 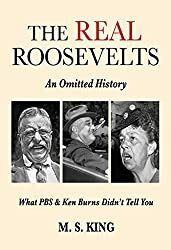 "...achieved greater political power than any other Jew in the nineteenth century — perhaps even in all American history." "Judah Philip Benjamin must be bracketed with Disraeli, who was his contemporary, as the ablest Jewish politician ever born under the British flag. But his career outdid Disraeli’s in audacity. Benjamin lived three lives in one." But certain people in Europe had a much higher opinion of Benjamin. 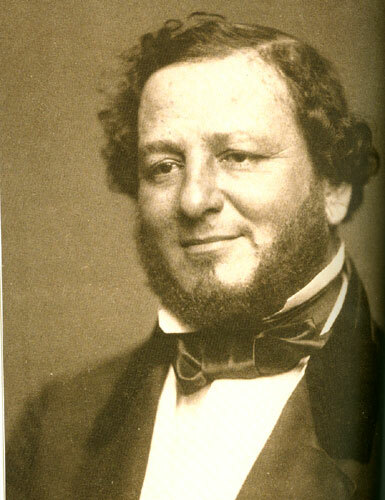 In 1861, Salomon de Rothschild - grandson of dynasty founder Mayer Amschel Rothschild - during a visit to Louisiana describes Benjamin as: “the greatest mind in North America.” (here) That pretty much tells us all we need to know about the “southern rebel” Judah Benjamin! 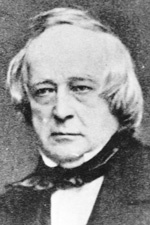 In the fall of 1859, de Rothschild, the son of Baron James de Rothschild of Paris, had come to the United States as a tourist. His travels in the North and South are recorded in a series of letters to his cousin Nathaniel in London. Rothschild met with prominent politicians (surely with Benjamin!) and commented on the issues of the day. His views were "pro-Confederate" and his letters urged cousin Nathan to use the family's influence to gain the recognition of the Confederacy by the European powers. Rothschilds for Dixie? - Sing it! - "Oh I wish I were in the land of Matzo..."
Solomon Rothschild (l) urged Nathan Rothschild (who resembles Judah Benjamin) to support the South. 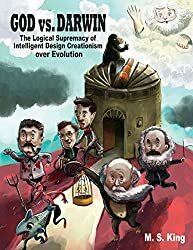 What is astonishing here, or rather, what is not astonishing, is the high position occupied by our co-religionists, or rather by those who were born into the faith and who, having married Christian women, and without converting, have forgotten the practices of their fathers. In 1862, Benjamin, under intense Congressional pressure, is forced to resign as War Secretary. Jefferson Davis then appoints his beleaguered adviser as the South’s Secretary of State! In this position, Benjamin will work with Slidell and Slidell’s French Jewish son-in-Law Erlanger to secure not just financing from the Rothschild syndicate, but also to induce the direct involvement of Rothschild’s Britain & France into the war, on the side of the South. A joint British & French entry into the war would have tipped the scales in favor of the South, and ultimately led to two American nations, both under foreign influence. Lincoln and his Secretary of State, William Seward block Judah Benjamin's scheme by turning to Russia for help. In a clear message to his old Rothschild-funded foes from the Crimean War, Czar Alexander II stations the better part of his Pacific fleet in San Francisco, and a portion of his western fleet in New York. The British & French instigators of the Crimean War get the message and are forced to back off. Judah Benjamin and the Rothschild financiers are thus thwarted. Together, Alex and Abe have defied the London Bankers and will both pay a heavy price for it. After the war, in recognition of, or payback for, Russia’s help in keeping Britain & France out of the war; Seward will arrange for the purchase of Alaska from Russia after the war – an act dismissed at the time as “Seward’s Folly”. But now we know the reason for the “folly". 1- The presence of Russian fleets in San Francisco and New York kept Judah Benjamin's British and French attack dogs at bay. 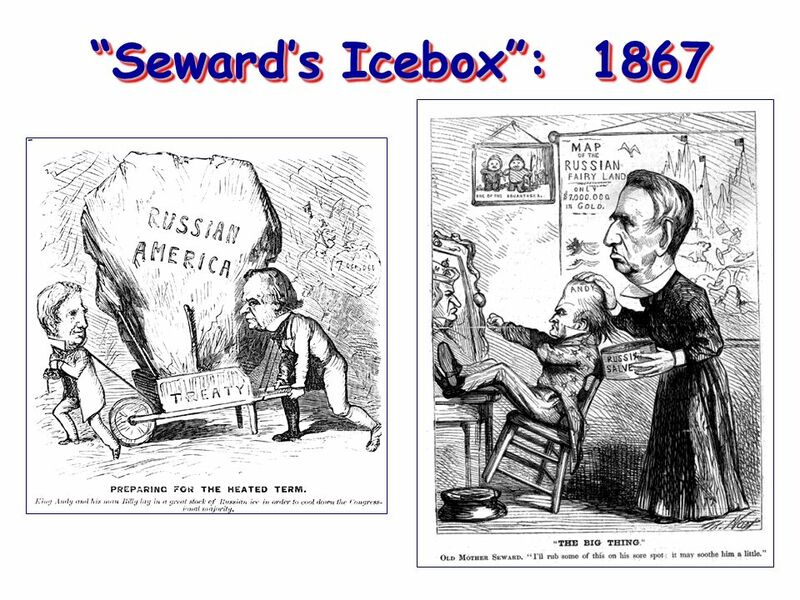 2- Seward's Folly was Union payback to Russia. "It is perhaps somewhat flattering to our national pride to know that the Rothschilds, who hold up every despotism in Europe, have concluded that it would be cheaper to buy up one of our political parties (Democrats), and in that way secure the dissolution of the Union, than to have their agents in England and France interfere and fight us. But Irishmen and Germans have a something, which for brevity we will all a 'crop,' and this fact sticks in their crop, that the oppressors of Ireland and Germany, the money kings of Europe, not daring to carry out their first pet project of breaking down this Government by the armed intervention, of England and France. Let Belmont state over his own signature, if he can that he and Rothschilds have not, directly or indirectly, in their own name, or in that of others, operated in Confederate stocks during this rebellion. Until he can face the music in that style it matters little what tune any of the Copperhead penny whistles may be authorized to blow, as they are very seldom authorized to state anything that is true." DID JUDAH BENJAMIN KILL LINCOLN? 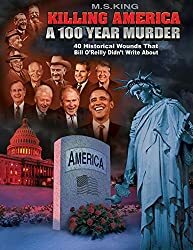 In the closing days of the American Civil War, a massive conspiracy to decapitate the U.S. government results in the assassination of President Lincoln by an actor with ties to secret societies. John Wilkes Booth shoots Lincoln in the back of the head as Lincoln and his wife watch a play at Ford’s Theatre. Booth escapes. On the same night of Lincoln’s murder, Lewis Powell, an associate of Booth, attacks Secretary of State William Seward in his home. Seward is stabbed in the face and neck before other men in the house subdue Powell. Seward’s wife Frances dies two months later from stress caused by seeing her husband nearly killed. Vice President Johnson and General Ulysses S Grant were also to have been killed. The “conspiracy theorists” of the day point the finger at Judah Benjamin, (here) who burns the official papers of the Confederate Secret Service right about this time. (here) Thanks to Bennie the Burner, the full story of Confederate clandestine services, and most likely the Lincoln assassination, may never be known. 1 & 2: Abe and Alex both paid with their lives for defying the Rothschilds. Judah Benjamin was suspected of engineering the Lincoln assassination. 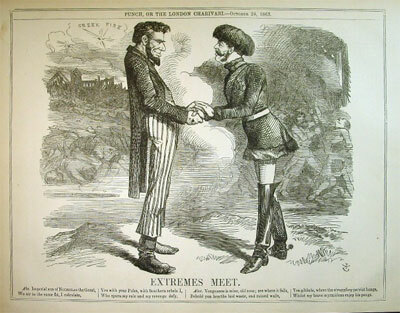 3 - "Extremes Meet" - British Press mocks Abe and Alexander's cooperation. Lincoln's alliance with the Rothschild family's most hated enemy, Russia, and his printing of interest-free 'Greenbacks" to finance the war were big "no-no's" that got him killed. 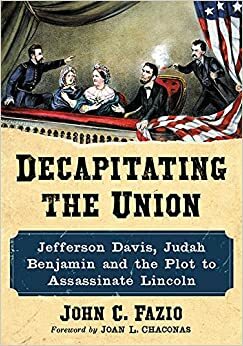 John Fazio's 'Decapitating the Union' supports the belief of many during that time that Judah Benjamin was the mastermind of the plot. As the south collapses, Benjamin stays in the home of a Jewish merchant in South Carolina while final surrender negotiations drag on. Here, Benjamin abandons President Davis's plan to fight on, telling him that the cause is hopeless. When negotiations fail, Benjamin remains part of the group around Davis that moves on with the President. Unfortunately for historians, and fortunately for the Rothschilds, Benjamin, exactly as he had done with papers pertaining to the Confederacy’s secret services in 1865, also burned his personal papers shortly before his death in 1884. 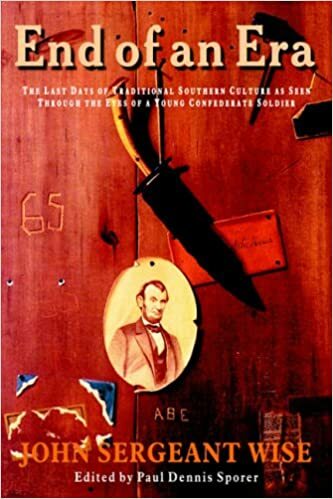 1 & 2 - John Wise's ‘End of an Era’ expresses the true Southern feeling toward the fleeing scoundrel Judah Benjamin, to whom the South was like "last year's bird's nest." 3 - After abandoning his Confederate colleagues and the people of the South, Benjamin the "British" Barrister went on to enjoy a hugely successful 2nd career in Rothschild’s London -- where he was a contemporary of Karl Marx and Benjamin Disraeli. 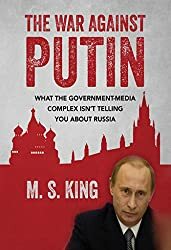 Now that you know the story of "The Confederate Kissinger" -- the reason his name is so little known should no longer be a mystery. MIKE KING'S ' MAGNUS OPUS' IS HERE! "Absolutely mind bending research... I was hooked immediately! 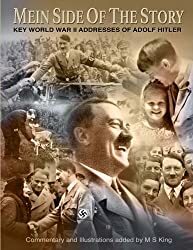 I had studied the NWO for years but had no idea of so many of the critical events revealed in PLANET ROTHSCHILD." 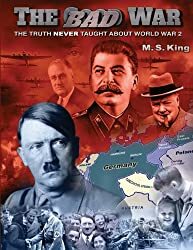 Convenient, downloadable & printable pdf versions of 'Planet Rothschild I & II' (600 pages, 1400 illustrations) PLUS 'The Bad War' pdf (245 pages, 500 illustrations / also embedded within Planet Rothschild) as a free extra bonus. All of the above PLUS a 6-month subscription to our AWESOME little daily feature -- 'The Anti-New York Times' (a daily, brass-knuckled rebuttal of biased headline stories of The New York Times). *Arrives via hidden webpage and daily E-mail -- full year of back issues included!